Jon and I haven't posted a "Pantheon" podcast for a little while, but we've timed the latest one - on Italian director Nanni Moretti - quite nicely. After all, Moretti was president of the jury in Cannes this year, where he just helped award the Palme d'Or to Michael Haneke's 'Amour'. 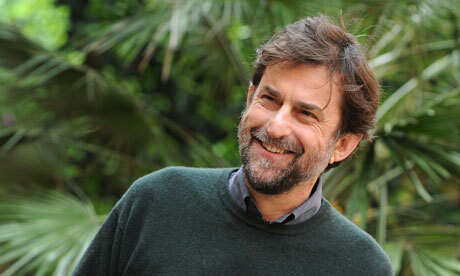 The comedy director's most recent film 'We Have A Pope' played in competition at last year's festival, but Moretti won the top prize himself in 2001 with his uncharacteristically straight drama 'The Son's Room'. Another of his films which found an audience outside of Italy was 2006's 'The Caiman' - a look at the scandal-filled political career of Silvio Berlusconi. Those three are varying degrees of brilliant, and probably represent his most polished work to date, but my personal favourites are his two most nakedly auto-biographical: 1993's joyously whimsical 'Caro diario' and 1998's tender and ambitious 'Aprile' (also to some extent about Berlusconi). Both are episodic and very light for the most part, but seem to best represent what Moretti is all about; He plays himself in both films, ever the self-aware, cinema-obsessed, germaphobic, left-wing intellectual, though less twitchy than Woody Allen. On the podcast we gloss over some of his earlier films, of the late-70s and 80s. In the case of the former that's down to the fact that they're (for me at least) incredibly difficult, requiring a degree of very specific contemporary Italian cultural knowledge to get the jokes and the political jibes. There are still some very funny moments but the dialogue is very quick and super-intellectual, which doesn't lend itself particularly well to sub-titled viewing. I think the relative calm of his more laid-back and urbane later stuff might be a key reason why it works better for me. In the case of his middle period - the 1980s - those are the only of his films I haven't yet managed to see. Though that's certainly something I'm going to remedy. In any case, the Moretti Pantheon is available now to iTunes subscribers and can also be streamed in an embedded media player here. The Pantheon series sees us look back at the entire career (or as much of it as we can get through) of a great auteur and assess the relative merits of their work, stating our favourites. Along the way we point out key themes and preoccupations of that filmmaker and try to give some sort of context as we take a chronological walk through filmography.